Grizzly 9729 - The Home Machinist! I have ordered a Grizzly 9729 and I am in the midst of building the table/stand for it. Does anyone have the distance between the bolt holes on the feet? I am welding in supports under the top of the table. it is 36X60X20 on the 6 inch casters it sets at 26.5 inches high . in them mine did . if you have any other questions post back i will check back to see if i can answer any other questions . 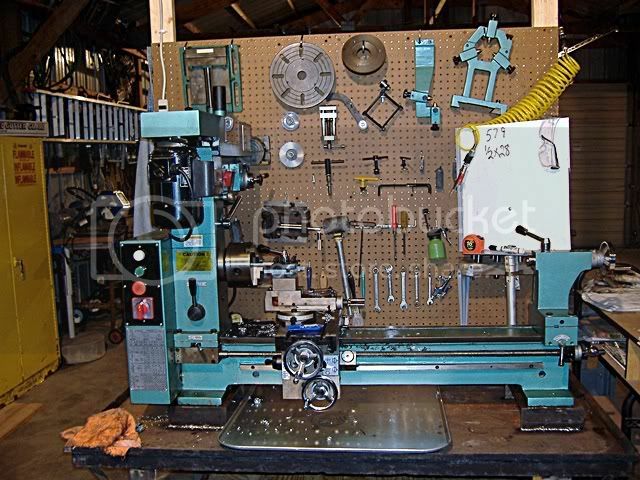 my small shop is 1/4 of a 24X36 metal building i also have a HF 5980 3in 1 machine i do all kinds of small projects from firearms to making parts for 4wheelers . i know you asked about this in 09 but i replied for others that may have the same questions . cobra wrote: I have ordered a Grizzly 9729 and I am in the midst of building the table/stand for it.